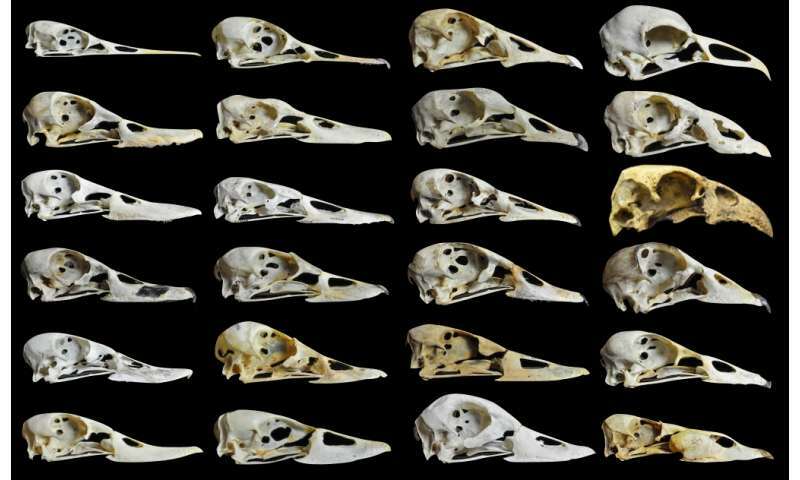 From Charles Darwin's famous finches to a new study that takes a rare look at a common order of birds—waterfowl—evolution has a tendency to reveals itself through bird beaks. And this new study confirms through a rigorous analysis that the main evolutionary force driving the shape of duck, goose and other waterfowl beaks is their diet. "This is the most comprehensive look to date at the relationship between diet and beak shape," said Aaron Olsen, author of the study in Functional Ecology and a postdoctoral researcher in Brown University's Department of Ecology and Evolutionary Biology. "Waterfowl have really interesting beaks relative to other birds," Olsen said. "They are very curvy with very diverse shapes." Working at the University of Chicago and the Field Museum of Natural History, Olsen sought to determine what accounts for that diversity. He expected that diet might play a substantial role, but rather than just compare simple dietary categories with beak caliper measurements as many naturalists have, he engaged in a more detailed analysis. He carefully measured the 3-D form of the beaks of 136 specimens of waterfowl, covering 51 species and 46 genera, including two extinct species. One fossil, Presbyornis, dates back tens of millions of years. Then he paired those measurements with detailed data that he gathered from the research literature on the diet of each bird. Regardless of his expectation, if diet and beak shape had little to do with each other, the math would have yielded low correlations. "What this analysis asks is, 'What are the patterns of correlation between these two datasets? '," Olsen said. "What's nice about that is you are going in a little bit naively about the relationship between the two." But the mathematical result was a strong correlation between dietary preferences and beak shape. It makes physical sense, Olsen said. Ducks, which primarily filter-feed little bugs and seeds from the water, have relatively long, wide-tipped bills that can bring in a lot of water. Geese, which evolved to prefer the leaves and roots of plants over filter feeding (though some still do), have shorter, narrower beaks that give geese a more forceful bite for pruning tough plant parts. The correlation is so strong, Olsen said, that diet likely dominates other influencers of beak shape that researchers have demonstrated, such as preening and shedding body heat. But Olsen said his analysis doesn't preclude those factors from still having roles, too. The data Olsen gathered, combined with several lines of prior research, also led him to hypothesize that the early ancestors of modern ducks, geese and other waterfowl were duck-like. Geese-like beaks are newer phenomena, though they've evolved several times in several places. First of all, Olsen said, a mathematical reconstruction he performed that accounted for modern waterfowl and the early ancestor in the waterfowl phylogenetic (or evolutionary family) tree, Presbyornis, showed that the duck-like beak is the most likely ancestral form. Moreover, the widespread emergence of grasses occurred after the origin of waterfowl, supporting a later origin for geese within waterfowl. The other extinct specimen whose bill Olsen surveyed, the fern-eating moa-nalos goose, may be a good example of the kind of transition he suspects played out multiple times over waterfowl's evolutionary history. Other researchers have shown the moa-nalos likely had a duck-like ancestor, but after its ancestors ended up in Hawaii, it adapted to its final plant-eating status by evolving goose-like features over time. All that said, Olsen acknowledges his assessment of waterfowl lineage remains an open hypothesis. He said he invites further research, even if it ultimately ruffles his feathers. "I would love to see someone publish a paper and argue the opposite," he said. Many species of Darwin's finches are known to interbreed and thus by definition are not new species at all but simply varieties within a single species. Moreover, DNA studies reveal very little difference between any of these birds. The author of the article continues to interject the words like "evolution" and "evolutionary force" (whatever that means---very unscientific) and "which evolved to prefer". Fact is that none of these are supported by any science, and is complete guesswork. We can observe animals that may prefer something. But to say as a scientific fact that evolutionary forces made this happen is complete nonsense. Those are 2 completely unrelated propositions. Scientists should not be so confused.